In Why I Love, PC Gamer writers pick an aspect of PC gaming that they love and write about why it’s brilliant. Today, Phil praises Mass Effect 3’s endings. The good ones, that is. 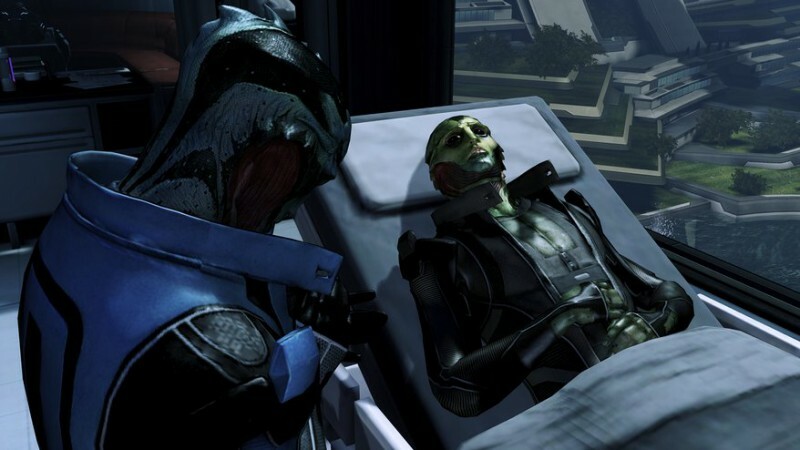 That’s right, I love Mass Effect 3’s endings. Come at me, internet. Actually, don’t. Because I don’t love Mass Effect 3’s final endings. They were fine. Reasonable. Good, even. The standard complaint against those endings is that they don’t reflect your decisions through the trilogy up to that point. That’s not entirely true—the ending I picked was perfectly in sync with Shepard’s actions and decisions over three games. The ‘pick-from-three-options’ Deus Ex-a-like structure was pretty cheap, but it ultimately resolved a seemingly unresolvable plot thread. That’s beside the point, though. Mass Effect 3 is a game about endings. Every main mission is an ending. Most of the side quests are an ending. From the start, the story is concluding and stripping away everything that had been built over the past two games. Many are brilliant; the kind of memorable farewell that has genuine emotional resonance. That’s quite an achievement for a big-budget RPG series about fun space adventure. It should go without saying that I’m going to be spoiling Mass Effect 3. And the Citadel DLC, too. Granted, ME3 leans a little heavily on sacrificial resolutions. Mordin, Legion and, ultimately, Shepard her/himself can all potentially offer themselves up for the greater good. Mordin Solus is my favourite of these, precisely because he isn’t a capital-H hero. He’s a scientist, who’s greatest achievement in the eyes of his people becomes his greatest source of regret. His guilt over his involvement in the Krogan genophage is apparent in Mass Effect 2, as is his belief that it was necessary. His final muttered bars of Gilbert & Sullivan might be a step too far into fan service, but so what? He’s earned it. There’s no grand sacrifice to Thane’s ending. He was dying. Then he dies. There is, however, a quiet, sad triumph. Thane’s story revolves around his son, Kolyat, and his desire to rescue him from a life of crime. By the time of his death, he’s succeeded. Kolyat stands with him, as does Shepard—who, in my game, he was romancing. He’s surrounded by his family, and—save from the fact that he won’t get to share in Shepard’s final battle—content with what he’s achieved. This isn’t a fate experienced by many major game characters. The Mordin end? Sure. The Shepard end? Sure. Dying in a hospital, surrounded by loved ones? Not usually, no. 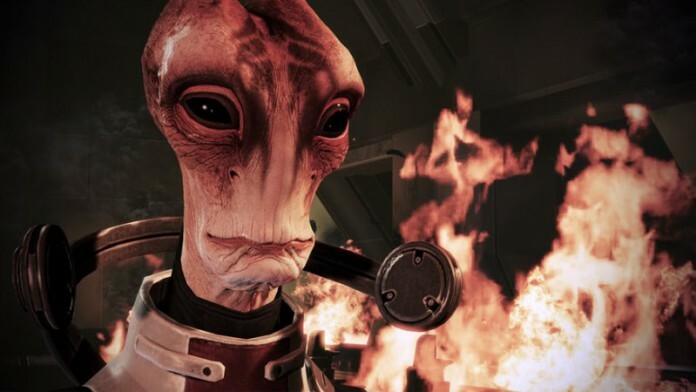 Mass Effect is a game series about big, galaxy-shifting decisions and impossible odds. And yet, Bioware still takes time to remind us to cherish the things that matter to us as individuals; both the people we love, and the goals we’re driven to achieve. As should be evident above, Mass Effect 3 is a pretty sombre game. The Citadel DLC pack couldn’t be more different. It’s brilliant; a campy celebration of the series’ successes and quirks. Tonally, it has no place in the main campaign. It’s better experienced after the fact, as an almost non-canon epilogue filled with jokes and fan service. There are too many great moments to mention, and it feels pointless to pick out individual bits for praise. It’s the most consistently funny Bioware has ever been, helped largely by the fact that it’s deconstructing and poking fun at deeply ingrained tropes and systems. It also functions as an ending proper, too. The final conversation—after the threat has been defeated and the party has petered out—is between Shepard and his/her closest companion. “We’ve had a good ride,” that companion will inevitably say. “The best,” Shepard states, summing up three games and hundreds of hours in two simple words. I’m a huge fan of Jennifer Hale’s performance throughout the series, but even I’ll admit that Mark Meer offers the best delivery of this line. It’s emotional, almost unbearably so, and a reminder that it was more than just the fans who were saying a final goodbye to a character they’d grown to love.